AWS has over 100 services, which is daunting for new users. Getting started can take a lot of time and effort. One of the most common small business uses for AWS is running high performance websites. Many small businesses use shared hosting, or low end plans, which are typically slow with significant limitations, both in resources and what you can do with your website. With AWS you can have your own high performance website that’s fast for people anywhere in the world. We offer Amazon Web Services consulting services and support, suitable for small to medium sized businesses. We can help get you started on AWS, set up websites including WordPress, get things set up for low maintenance trouble free operation, and provide any necessary support. We have been using AWS since 2014, and have had all our websites, backups, and archives on AWS since then. We’ve worked with multiple customers to deploy websites on AWS, including one very large enterprise customer. 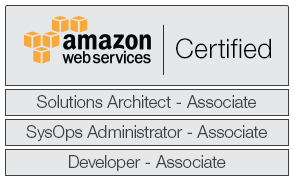 Tim holds the AWS Certified Solution Architect qualification at the professional level, AWS Certified System Operator at the associate level, and AWS Certified Developer at the associate level.